On September 8, 2015 Joaquin Andujar died. The vast majority of the readers of this blog have no idea who this man was. When I learned of his death, it reminded me of why I study what I study and of whom I study. Joaquin Andujar was a former Major League pitcher, who pitched for the Houston Astros, St. Louis Cardinals, and Oakland Athletics from 1976 to 1988. I first encountered Joaquin Andujar in the mid-70s when I was a boy developing my life-long love for baseball and the Houston Astros. In New Orleans, the Astros were our “hometown” team. I listened to the games on the radio and I recall the sonorous voice of Gene Elston, then the radio voice of the Astros, pronouncing “Joaquin Andujar.” I thought that was such a great name. In those days, NBC and ABC rarely telecasted Astro games. In the mid-to-late 1970s the Astros were a young, and marginally talented squad usually occupying the cellar in the National League West. I had names, but no faces of my favorite players. It was in 1978 that my father took me to my first Major League game in Houston at the Astrodome. He bought a media guide, and I spent much of the time between innings pouring over the pages, carefully studying the pictures of the players. I came to Joaquin Andujar’s picture early, and I received a revelation: he was black. He was black, and from San Pedro de Marcoris, Dominican Republic. 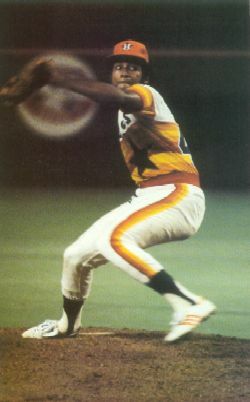 I noticed my favorite player, Cesar Cedeno, was also black and from the Dominican Republic. I saw that the veteran Jesus Alou was also from the Dominican Republic. As a nine-year-old boy, I had never heard of that place where people are black and become Major League Baseball players. I wanted to learn more about that place. I did learn more about the Dominican Republic in the years to come. As I watched more baseball, television announcers like NBC’s Tony Kubek would inform the viewers about players from the Dominican Republic. During the 1980s, Dominican players began to flood major league rosters. The Toronto Bluejays had a strong Dominican presence in the 80s with players such as Alfredo Griffin, Tony Fernandez, George Bell, and Damaso Garcia. I remember watching Dodger games, and Kubek referring to the town San Pedro de Marcoris in connection with the young Dodger player, Pedro Guerrero. From that time on, I noticed players from the Dominican. Since I was in high school from 1982-1986, I decided to take Spanish. At least, I could pronounce Spanish names and learn more about Latin American culture. It was during high school that it became clearer to me that there are black people from Latin America outside of the Dominican. One of my classmates’ mother was black and from Nicaragua. My 12th grade Spanish teacher was a black woman from Panama. Though these pieces of information had begun to fill the blank spaces in my mind about the history and cultures of Latin America, I was still groping. It had to be in college that the presence of people of African descent in Latin America became clearer to me. I minored in Afro-American history, and taking an introductory class on Afro-American Culture and History introduced me to the African Diaspora. In reading John Hope Franklin’s From Slavery to Freedom, I learned that the Trans-Atlantic Slave Trade dispersed Africans to Brazil and other parts of South America, but also to the Caribbean, Mexico, and Central America. In fact, more Africans were slaves in Latin America and the Caribbean than in the United States. Well, that helped to explain Pele, my soccer hero, a black man from Brazil. It wasn’t until I began Ph.D studies that I had a concentration on Afro-Latinos, choosing Latin American history as a minor field of study complementing my major field of African history. In my coursework in Latin American history, I studied the Mexican Revolution; but my love was for slavery and abolition in Brazil, Venezuela, Peru, Argentina, and Mexico. I read about the “disappearance” of the blacks of Argentina post-slavery, which led me to tackle the issue of “whitening” in Latin American republics during the late 19th and early 20th centuries as they redefined themselves as “mestizo” nations, excluding their African heritages though one could see it in the faces of many people and hear it in the sounds of the music. From this foundation, I have branched out into studying Haitian history, especially slavery and the Haitian Revolution. Yes, I began to study the complicated issue of race and identity in the Dominican Republic, Venezuela, Peru, and Brazil. As a trained Africanist, I view African history and culture as foundational to understanding the cultures of the Americas just as much as knowing Iberian history and culture or the history and cultures of Western Europe. The Americas are creole societies. In some areas of Latin America such as Brazil, Cuba, the Dominican Republic, and Venezuela knowledge of African history and culture from 1400 to 1860 is critical. This became more apparent to me as I read that Iberian-born Africans who were Roman Catholic and speakers of Portuguese or Spanish were called “Ladinos.” As a I read Leslie B. Rout’s The African Experience in Spanish America, it was even more apparent that Africa’s legacy in the New World runs deep. As I write this blog, we are nearing the end of Hispanic Heritage Month. I have a deep love for Latino cultures, and this is why I have re-committed to learning Spanish. There can be no Latino culture without some key ingredients contributed by African slave captives. This is something that must be shouted! Recently, I shared some of what I have written to a colleague who is an American-born Dominican. He said I should write about it. Here I am writing about it. In part, I now understand the general heritage of the new Baseball Hall of Famer, Pedro Martinez, and other players like David Ortiz, Johnny Cueto, and Carlos Gomez. I have come full circle. My interest in Afro-Latino history and culture has stemmed from my love of baseball and my curiosity regarding why there were black people in a Spanish-speaking place in the Caribbean. Joaquin Andujar was a solid Major League pitcher, a character of the game. He is famous for exclaiming that his favorite word in English was “youneverknow.” That was Joaquin Andujar. One never knows what can serve to spark passions and interest in life. Joaquin Andujar has helped to open the gate for me into the academic study of Afro-Latinos. This entry was posted in Eric Washington and tagged African American history, Afro-Caribbean, baseball, black history, history, Joaquin Andujar, Latin America, Major League Baseball, MLB, sports history. Bookmark the permalink. Thank you Professor Washington. As a baseball fan and Virgin Islander who had relatives who migrated to the Dominican Republic to seek work in the cane fields , I too have heard stories of the DR during the reign of “Trujillo” from men who returned in the early 50’s. I will continue to read about these pioneers of the Caribbean in baseball.